This high performance floor-standing speaker uses a two-way, three-speaker configuration with two 16cm (6-1/2) cone woofers and one 3cm (1) soft dome tweeter for beautifully clear sound with immensely powerful bass. A perfect match for large-screen TVs. 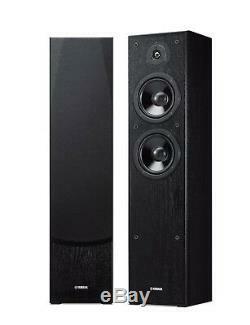 A home theatre speaker system that provides full enjoyment of even HD sound sources. Two 16cm (6-1/2) cone woofers and 3cm (1) soft dome tweeter for strong bass and smooth full-range sound. Low-diffraction rounded form for clear sound free of murkiness. A front grille and rounded form with luxurious, upscale design. The item "Yamaha NSF51 High Performance Floorstanding Speakers (Pair) Black" is in sale since Tuesday, June 26, 2018. This item is in the category "Sound & Vision\Home Audio & HiFi Separates\Speakers & Subwoofers". The seller is "hificonf" and is located in london.